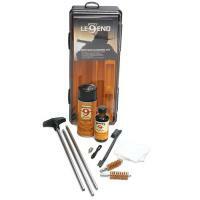 Hoppe's creates a product of true lore with their universal, Legend Shotgun Cleaning Kit. The kit contains all shotgun-cleaning essentials including the following: Hoppe's No. 9 Gun Bore Cleaner, lubricating oil, a nylon brush, cotton cleaning patches, a three-piece aluminum rod and additional accessories and brushes. Packaged in a sturdy, reusable plastic box with double hinges and a latch ensures items stay dry and dust-free. Kit components fit well in the box's interior, allowing for convenient portability and storage. The cleaning kit is compatible with all gauges and is well-suited for use by casual enthusiasts and professionals alike.